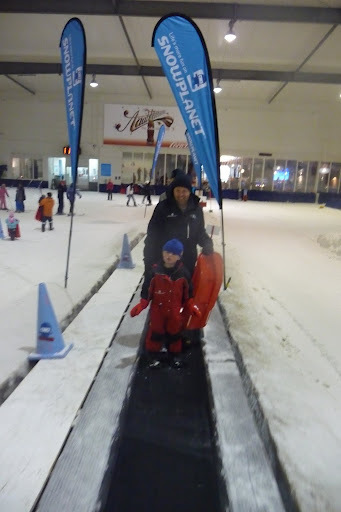 We had a terrific time at Snowplanet today. 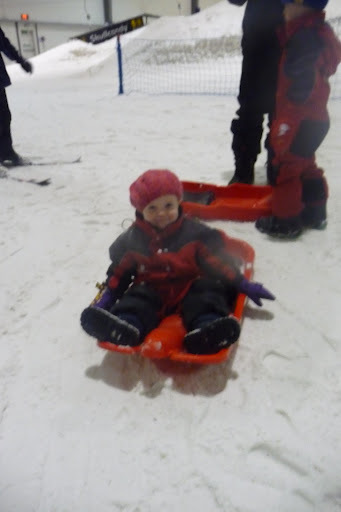 They have a great deal for families with kids which includes full clothing hire for the children, including snow boots, as well as a toboggan. 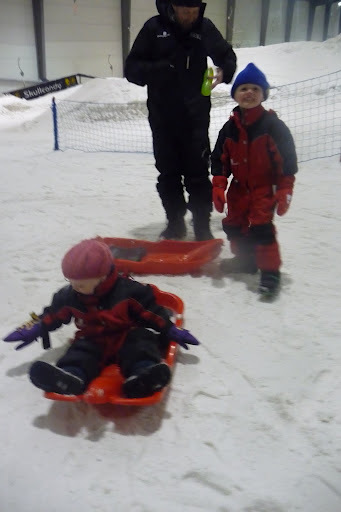 So we spent a happy hour or so riding up the magic carpet then sliding down the gentle slope. Both kids thought it was great. 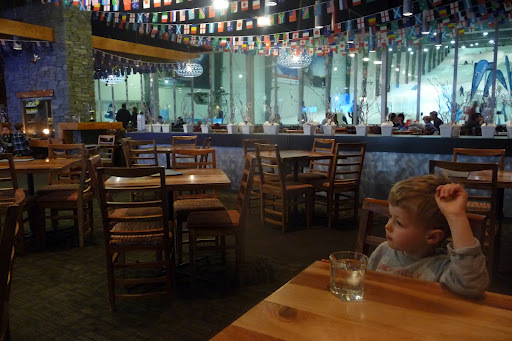 Then we had lunch in their restaurant and afterwards the kids played in the kids’ play area with Ben keeping guard while I went for a ski. 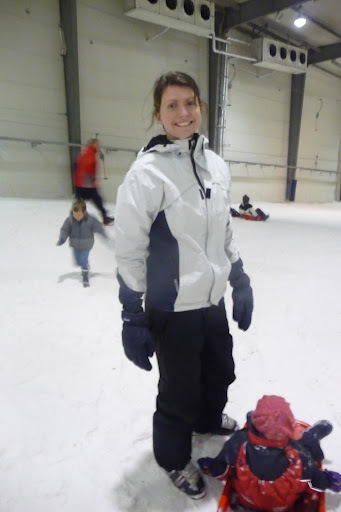 It has been almost 10 years since I went skiing but I quickly found my ski legs again. Some photos. Elizabeth getting ready for wheeee! 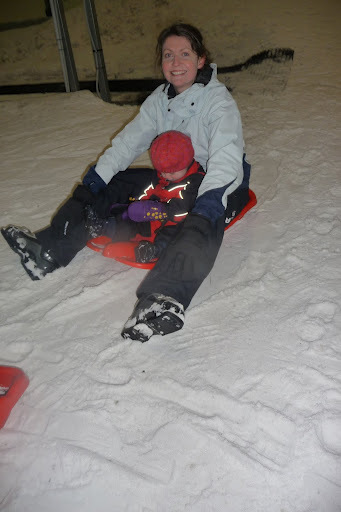 At just 20 minutes north of Auckland by car, it’s definitely a fun outing for families with children, regardless of whether you’re accomplished skiiers. The only negatives are that one of the best features of skiing is the surrounding landscape which almost always has breath-taking views. It’s just not quite the same inside a building. But this is balanced by the fact you can visit 365 days per year whatever the weather. It’s also right on our doorstep. The other negative which was disappointing for Daniel is the snow wasn’t very good for building a snowman with. 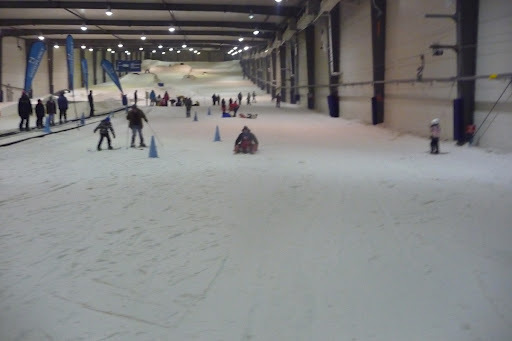 It was soft and powdery: just the sort of stuff you want for skiing and tobogganing but not mushy enough for a snowman. The restaurant had a great atmosphere with a roaring fire and was nice and warm. A great place, a great outing, we’ll be back.